Anyone seeking information about Albert of Vercelli, papal legate and patriarch of Jerusalem from 1206-1214 in the general histories of the Crusades will normally be very disappointed. Many histories do not mention him at all and those that do usually limit themselves to a brief mention in a line or two. This seems somewhat unfair on Albert who deserves to be rated as one of the most able and experienced papal appointments to the twin roles of papal legate and patriarch. Born around 1150 to a wealthy family living near Parma in northern Italy, Albert received a good literary education and then enrolled in the Canons Regular of Mortara in 1170 where he studied for the priesthood and was ordained. His administrative abilities were soon recognised and he was elected as Prior for life around 1178. Then in 1181 he was appointed as a papal judge by Pope Lucius III and he served as a judge on several subsequent occasions. In 1184 he was elected as bishop of Bobbio but, before he could be formally consecrated, he was elected as bishop of Vercelli and consecrated there in April 1185. Albert occupied the see from 1185-1205 and gave evidence of his administrative abilities in his organisation of the diocese and his skill as a judge and arbitrator in settling disputes and in directing secular matters under his title as Imperial Count of Vercelli. In his later years in Vercelli, Albert was used by Pope Innocent III on a number of diplomatic and other missions and it was his skill in these missions and his growing reputation as a conscientious and dedicated bishop that probably led to his election by the canons of the Holy Sepulchre as the Latin Patriarch of Jerusalem. This nomination was enthusiastically received by Pope Innocent in February 1205 and then accepted, somewhat reluctantly, by Albert himself. Early in 1206, Albert sailed for the Holy Land and arrived, probably in March of that year. The situation that faced him in the Holy Land was not an easy one. Although the Third Crusade had recaptured Acre and a strip of the coastal plain down to Jaffa, the remainder of the Holy Land still lay under Muslim control and in 1206 a precarious truce between the two sides was due to expire. Not only had Albert to play his role in maintaining the peace and security of the Latin state but he had also to contend with the perennial warring between the nobles ruling the different parts of the Latin territory and with trying to quell the persistent quarrelling between the various military orders, particularly the Templars and the Hospitallers. Albert played a significant role in a range of diplomatic negotiations and also in the pastoral care of his Christian flock. Sadly his role was brought to an abrupt end in September 1214 when he was stabbed to death during a procession by the Master of the Hospital of the Holy Spirit whom Albert had deposed because he judged him unworthy of his position. Curiously, Albert would have remained relatively unknown had it not been for a small episode which took place towards the end of his time in Acre. Around 1212, a small group came down from Mount Carmel and asked him for permission to have their community of hermits who lived in a valley on the south side of the mountain recognised as a formal religious order. Albert drew up a "Way of Life" for them to follow although sadly his death brought an end to his further involvement. However, the hermits flourished and, as the Muslim pressure increased, many of them migrated back to Europe where they became one of the mendicant orders of friars, the Brothers of the Blessed Mary of Mount Carmel (or Carmelites). The Carmelites though have never forgotten Albert of Jerusalem who gave them their first "Way of Life". He is recognised as a saint in their calendar and, in recent years, numerous books have been written on Albert and the "Way of Life" which he bequeathed to them. Brother Pat Mullins' two volume "Documentary Biography" is one of the latest of these publications and the scale of his researches, over 1200 pages, is a treasure trove for anyone seeking to learn more about Albert and a worthy tribute to a legate who gave his life in the service of the Church. Patrick Mullins has brought together an enormous collection of documents written by or reflecting on the activities of Albert. Inevitably such a collection is not always easy reading but it is a valuable resource for any studying the life of an Italian bishop at that period or the affairs in the Holy Land between 1206-1214. 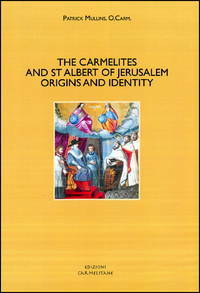 Patrick Mullins' efforts mark the culmination of a series of books which he has produced on Albert, his "Way of Life" and the early Carmelites, these include St Albert of Jerusalem and the Roots of Carmelite Spirituality (2012), The Carmelites and St Albert of Jerusalem: Origins and Identity (2015), and The Bollandist Dossier on St Albert of Jerusalem (2015). And another essay of Patrick Mullins has just appeared: "The Carmelite Rule: Text and Authors", in Celebrating Albert and His Rule, ed. Michelle Sauer and Kevin Alban (2017), 25-34. 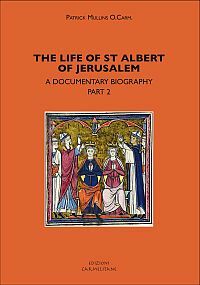 In the face of such scholarship, one hesitates to add any critical remarks but there are a few aspects of the two volumes on The Life of St Albert which may alert the reader to take care. The major problem is with the index which accompanies each volume. It is clearly signalled at the beginning of each index that entries are arranged in reverse of the usual order, e.g. 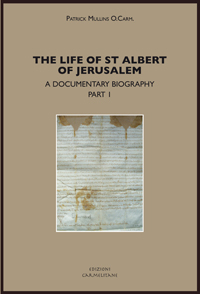 entries on Albert of Jerusalem are to be found under each of the many titles which Albert had, so, in volume 1, there are entries for him under "Bobbio, bishop-elect"; "Jerusalem, patriarch"; "Vercelli, bishop and count" (not just bishop) and "Holy Cross of Mortara, canons regular, priors" as well as two unattached entries: "Albertus Episcopus (1200)" and "Albertus Vercellensis (1196)". This can be quite confusing as the Canons Regular of Mortara do not occur under Mortara but under "Holy Cross". In addition, the page numbers given in volume 1 index, seem to go astray around page 227 as all later page numbers are one out, i.e. Pavia is cited to appear on page 227 but actually is found on page 228, etc. Unfortunately, the index in volume 2 is worse as the page numbers given there can be up to 9 pages wrong, e.g. Philip Ribot is cited as appearing on page 458 but actually occurs on page 467 whilst bishop Walter of Acre has a reference to page 499 but this should correctly be page 508. Lastly, Patrick Mullins shows some excellent research in tracing the phrases and quotations given in the Carmelite Rule and probably deserves a prize for the largest number of footnotes used, i.e. 155 footnotes for a Rule which contains only 1750 words. 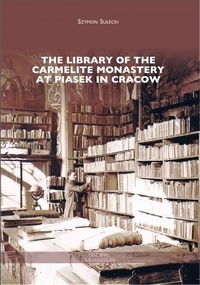 This painstaking research will be a great boon to Carmelites and others who study the formation of the Rule and its sources. My only problem here is with the fact that 84 of these footnotes refer to Patrick Mullins' earlier book St Albert of Jerusalem and the Roots of Carmelite Spirituality. Carmelite communities are usually fortunate to have complete sets of his works but for lay historians studying our Order, especially students in educational establishments, there is no guarantee that all the works which Patrick Mullins has written will be available in their libraries. It would have been nicer to see the section on the Rule in volume 2 as a more self-contained text. However, the above criticisms should not detract from what is a tremendous piece of research on the life of St Albert which is going to serve as an essential source for anyone studying the life of St Albert and especially for Patrick's and my fellow Carmelites who, hopefully, will seek to learn more about the very talented papal legate who first provided us with a framework by which to live our religious lives.